At Laggangairn you can see two standing stones to which early Christian crosses were later added, set in a remote moorland location on the Southern Upland Way. The two stones are thought to be the only survivors of a circle of 14 stones, seven of which were still standing in 1873. The stones are only 2 feet apart. The taller is 6'2" high, 1' thick, and just over 2' wide. The smaller stone is 5'2" high, 8" thick, and is also 2'2" wide. The cross carvings may date from the 6th-8th century, and stand on the site of a now lost village. Each stone has an incised cross carved on its west face. These are Latin style crosses, ranging 2-3' high, with extended arms and crosslets in the angles of the arms. About 45' to the west is a small standing stone which is said to mark the grave of the farmer who took away some of the other stones. 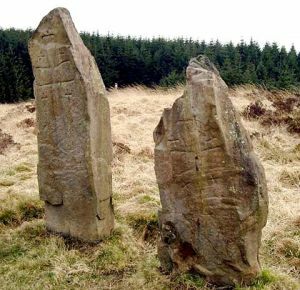 A Victorian report suggested that two of the removed stones are thought to have been used as gateposts at Pultadie and 2 others suffered the same fate at Kilgallioch. Laggangairn is one of the more difficult historic sites to get to; a stiff 5 miles walk along the Southern Upland Way from New Luce provides the easiest access. 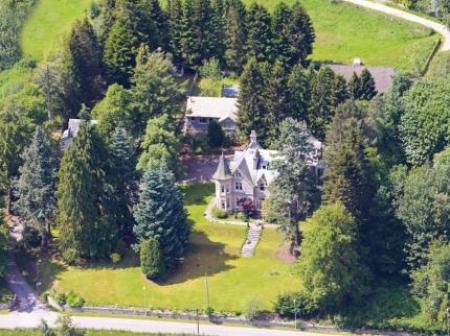 Location: From New Luce take the minor road past the church to Balmurrie Farm. Then by foot along the Southern Upland Way for 5 miles. As an alternative, walk along the Way from Polbae in a southerly directlion.